So first, in my sustainable agriculture/local food systems/school food project work in VT, I noticed that interest in REAL food often skipped a generation--the 50s generation of food science and availability of "fast foods"-- but seems to be back among young people in search of some sort of...AUTHENTICITY (I said it). But who are also interested in health, local communities, radical leftist ideas, people power. One of my personal ideals is to restore value in HANDS-- I want to value things that are made by hands, by real people, and I also want to be able to do things with my own hands--do things for myself. I want to build as many "hand-based" skills as possible. I think this arises out of independence (rugged American individualism?! ), perhaps a distrust in the modern world (at least in technology! ), value of traditional arts and work, and certainly feminism. 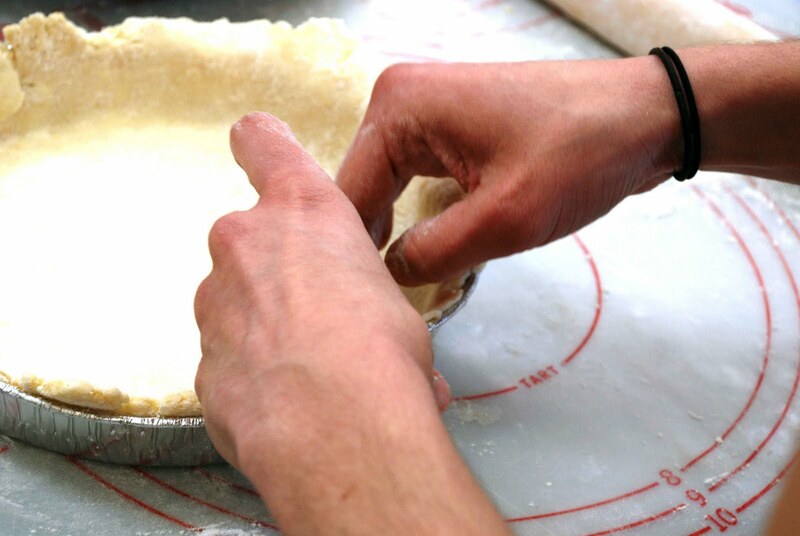 When I think about why I love to bake, pie especially, I think about how it is a tradition, an art, and a love. The most amazing thing about traditional foods is that it is an artful expression and often a loving expression that you actually INGEST and make a part of you. Literally! I think that is so wild. So when you make a pie, you are calling upon all that past hand knowledge from so many women (mostly) of past generations. Then you invite other people to share that tradition and knowledge and love with you as you sit around the table, and then you EAT IT! It kind of blows my mind. I also think about how the domestic arts were often the only outlet for women to creatively express themselves in past generations. Food traditions have had the best survival, perhaps, because food hits you where it counts--in the gut. Everyone has to eat, and I think it's where a lot of political change can happen. 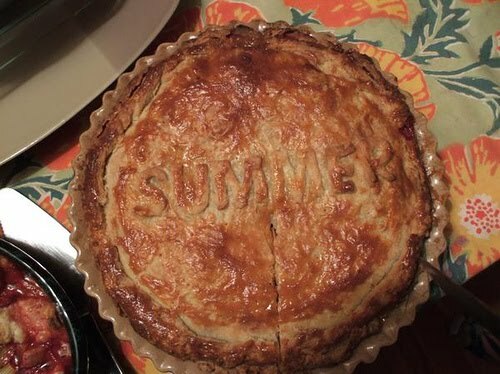 For me there is something specific about pie in that it uses fruit, which calls awareness to seasonality and locality--place and nature. You bake with what is available at the time, and in the winter that's storage apples (maybe) and nuts and squash, and in the summer it's berries and peaches. Pies are tied to place and time. My mom was always the pie baker in my family, and I didn't get into it until I started discovering all these mulberry trees and black-raspberry bushes all over Ann Arbor (where I was living at the time). It became a sort of ritual, often shared with friends, to go pick the berries--I did it nearly every day of the summer. We called it guerilla urban berry picking, and sometimes went at night, bringing along chairs to reach the high branches, feeling all the more guerilla. I became really invested in berry picking, and loved how I could get into a sort of meditative state while also being outside and doing something productive. (Thoreau has some great writing about going huckleberry picking--in his journals, Walden, and Civil Disobedience.) Since I was getting the berries for free, I began making a lot of pies, and would leave them on neighbors/friends doorsteps (or give them to boys I had crushes on). So that's it. My love for pie. It is out of a desire for self-sufficiency, valuing of tradition, feminism, connection to the land and the seasons, and an artful expression of love that we injest-- make part of ourselves. Plus it's delicious. fun. WILD! Emily, that is beautiful. I think pie is the new pagan sacrament. This was definitely an email worth sharing. I like re-reading it, and it is definitely hot, hot, hot thesis material. What lovely musings on pie. And happy birthday to you, pie girl! right there with you. . . i also LOVE pie! You said it all! I too love pie- both eating and creating them. Thanks for sharing. I love your pie blog! And I love pie. I'm not a great baker, but I do make a pretty nice lemon meringue pie. Also not as creative as your pimento pie people...who knew! I obviously have a lot to learn about pies. What a fun blog! Nice blog! Check out Pie Ranch, in Pescadero, CA. They are using the concept of "pie" to inspire and connect rural and urban people to know the source of their food, and to work together to bring greater health to the food system from seed to table. Was checking out new blogs and just discovered yours. So awesome! Pie! Woohoo! Ok, now that I'm done with that... lol... just saying hello. Became a follower. Come check out my blog if you're ever in the neighborhood. I came across your blog accidentally, but I am enjoying it. Your posts are interesting. I love eating pie.